OSWEGO, NY – Members of Oswego Firefighters IAFF Local #126 presented Carolyn Handville, coordinator of Oswego County Opportunities’ Cancer Services Program Partnership with a $3,500 check. From left are: Lt. Brooks Hourigan; Oswego Fire Department Chief Jeff McCrobie; Firefighter Carl Emmons; Carolyn Handville; and Oswego Mayor Tom Gillen. 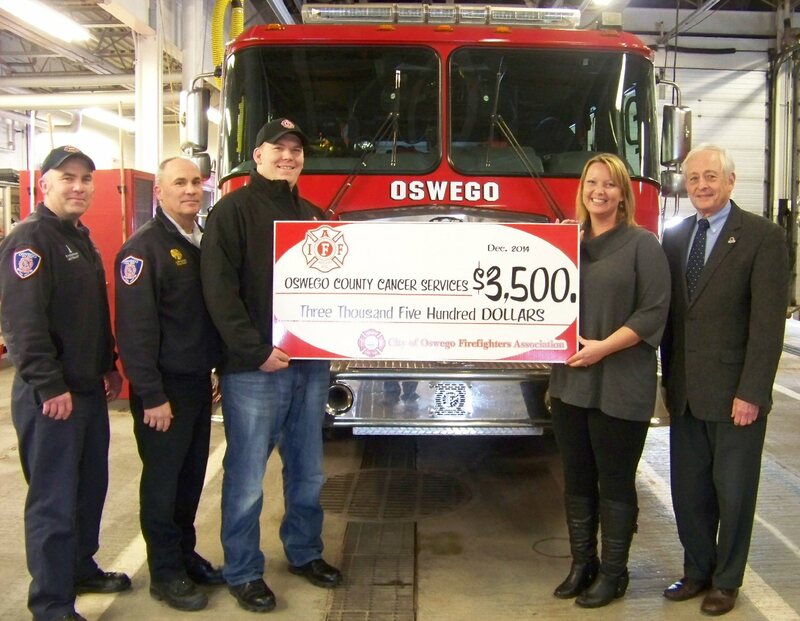 The Oswego Firefighters raised the money by selling specially designed pink T-shirts in recognition of Breast Cancer Awareness Month. The pink T-shirt sales exceeded the previous year by $1,000. Firefighter Carl Emmons said they have set a goal $5,000 for this year.